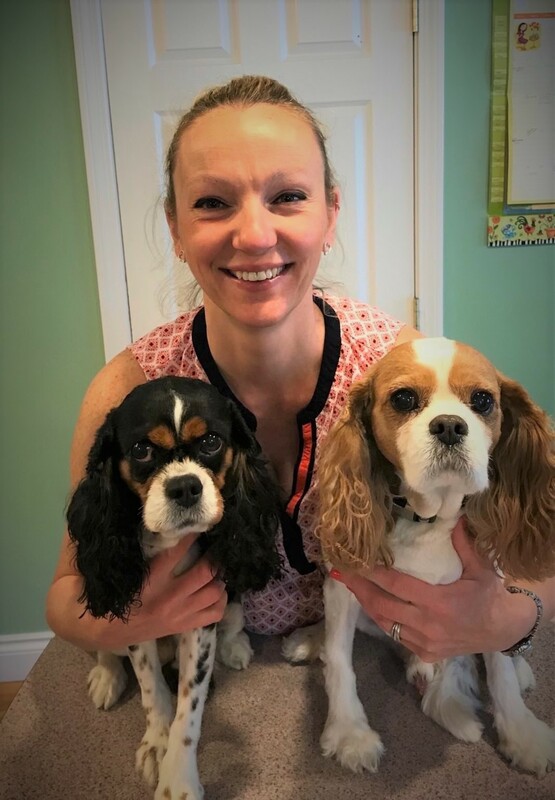 Dr. Shively earned her Bachelor of Science from the University of New Hampshire, her Master of Science from Washington State University and her DVM from the Tufts Cummings School of Veterinary Medicine. She is a member of the American Veterinary Medical Association and the Maine Veterinary Medical Association. 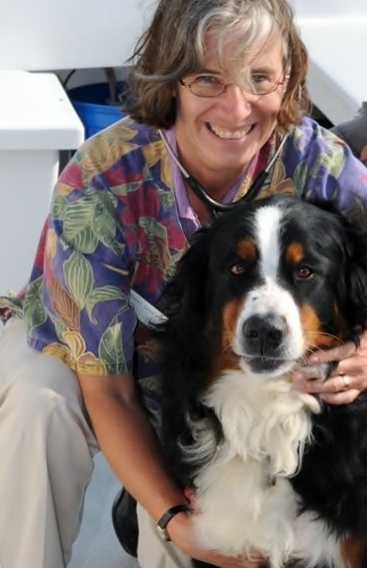 She is past President of the New England Veterinary Medical Association and a Trustee for the Veterinary Scholarship Trust of New England, which strives to improve the quality of veterinary care in the region by helping the veterinarians of tomorrow reduce the substantial debt they incur while in school. In the fall of 1987, Dr. Shively moved her practice from Kittery to Kennebunk. Since then, she has enjoyed practicing in the small community. She supports numerous community groups and initiatives, and enjoys the multi-generational aspect of her relationships with clients. Some of the people who bring their pets in today are the children of her first clients. And helping keep pets healthy and happy from puppies and kittens to seniors is one of the most rewarding aspects of practicing in primary veterinary care. Dr. Shively shares her home with her husband and daughter. They round out the family with their crazy Staffordshire bull terrier Lillie, rambunctious cat Fuzzy, mild mannered tabby cat Patch and Corona the goldfish. You can tell a lot about Dr. Shively by how she spends her time off. In addition to skiing, reading and gardening, she is an avid horseback rider - riding once a week and serving as the veterinarian on duty at competitive trail rides. While we don't see large animals here, she has long studied their care, including publishing an article on Equine Infectious Anemia Virus. And each summer, when most people on vacation with access to a boat would be out on the water sunning themselves, Dr. Shively is on a boat - making "house calls" to the islands of Blue Hill Bay. She runs the Dockside program, where island animals can be seen on the boat and avoid the long trek to the mainland. Dr. Odrzywolski (we call him Dr. O) has been enjoying the practice of veterinary medicine since 1987. In fact, he and Dr. Shively went to Tufts together. He hails from Buffalo, N.Y. and earned his Bachelor of Science with Distinction from Cornell University. He found his calling during his junior year, when he spent a semester studying marine biology and ocean sciences at the Isle of Shoals and aboard the Westward. He earned his DVM at Tufts University School of Veterinary Medicine. Dr. O interned at Angell Memorial Animal Hospital in Boston - at that time, a specialty, emergency and primary care hospital serving 80,000 patients per year. It was a very competitive internship that afforded a diversity of health issues few doctors get to experience. He says it was like putting my first five years of private practice into fourteen months. It helped him develop the medical philosophy and proficiency that he has today. It also made him to a die-hard member of Red Sox Nation. As a primary care physician, Dr. O is well versed in all aspects of veterinary care for companion animals. His strongest interests lie in internal medicine and endocrinology, where answers can be elusive and treatment long-term. He is especially skilled with soft tissue surgical procedures and veterinary dentistry. The reason we are particularly lucky to have Dr. O on our team is his ability to work in partnership with pet owners. He spent three years teaching anatomy and physiology, where he learned how to make complex physiological information straight forward and clear. Anyone who has had a sick pet can appreciate that skill. And Dr. O is keenly aware of the strong bond between animals and their people, and the need for compassionate and humane end of life care. He is sensitive to the conflicting emotions and priorities people struggle with and prides himself on helping support them through the passage, making it a peaceful and dignified experience. Dr. O lives locally with his two teenagers and two very sweet tuxedo cats, Jasper and Ezmea. Dr. Porell joined our team in 2006. She earned her Bachelor of Science from Binghamton University and her DVM from Ross University in St. Kitts, West Indies. It sounds like the kind of place you go to work on your tan, but don't let that fool you. Dr. Porell is a top notch primary care physician. She interned at Manhattan Vet Group and practiced in New York City for three years before moving to Maine. 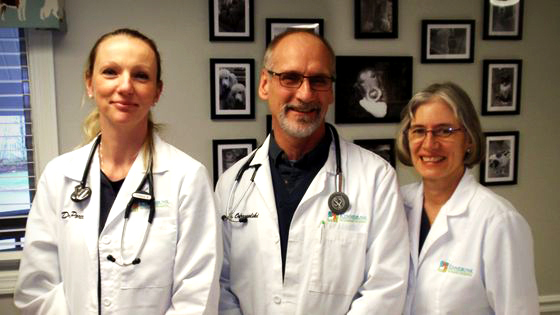 Like Dr. Shively and Dr. O, Dr. Porell is a general practitioner who covers all aspects of small animal medicine. Her rigorous training and gift for attention to detail make her the most thorough provider you'll find. A strong believer in Evidence Based Medicine, you will often find her digging into journals and researching the latest updates in veterinary practice globally. Her special interests include Emergency Medicine, Internal Medicine and Ophthalmology. She is a member of the American Veterinary Medical Association and regularly takes opportunities to expand her training and expertise. She still misses NYC, and the sunny winters of St. Kitts. Who wouldn't. But she now loves living in Kennebunk with her husband and their two children. They have two King Charles Cavalier Spaniels, Oscar and Prada.